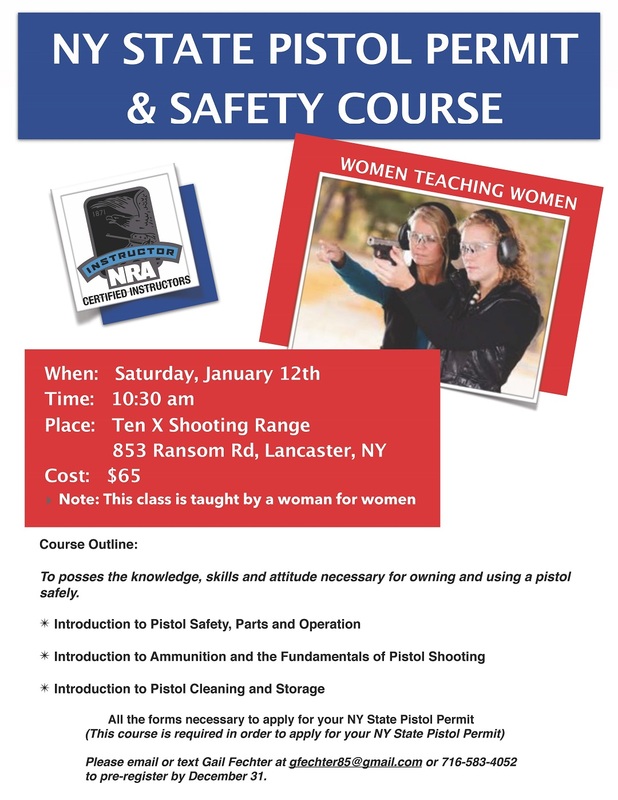 This coming Saturday, January 12th at 10:30am at the club, Gail Fechter will be holding the NRA basic Pistol Permit Course. The cost for this course is $65 and includes all the necessary forms that you will need to start the process to apply for your NYS Pistol Permit. If you are interested in attending, please contact me at gfechter85@gmail.com no later than Thursday so I will have enough packets with all the information. I look forward to seeing all. Courtesy of member Gail Fechter, we will be hosting a pistol permit pre-licensing safety course. This is the NRA Basic Pistol course that fulfills the safety training requirement for new pistol permit applicants in Erie and Niagara County. This is intended to be a “For Women Only” course, and will be taught by a female instructor. Interested persons should contact Gail Fechter (gfechter85@gmail.com) for more information and to sign up. Here are the pictures from the 2018 Awards Banquet that was held on Saturday April 28th. This year Tex X Shooting Club was represented very well with two tables and won the Ed Rose Memorial Trophy. The club finished first this year with 26 wins and 6 loses overall. Thanks to all those that came out for the banquet. ATTENTION ALL PISTOL PERMIT HOLDERS!!!!! Are you one of the many that still need to re-certify your pistol permit? Well if so here are some links that might be helpful for you. Also here is a link to the NYS Pistol Permit Recertification site in case you need any other information. Continue reading ATTENTION ALL PISTOL PERMIT HOLDERS!!!!! If you’re curious about firearms, whether for personal defense or to learn a new sport, Ten X Shooting Club is the perfect place to start. Our Empowered Women’s clinics will teach the basics of firearm safety and give you the confidence you need to safely handle and operate a firearm upon completion. No experience is needed and we will provide all the necessary materials for the course. Here is a list of everyone that has put in volunteer hours so far this year. I will also have some sheet available tomorrow night at our general meeting. If anyone is short hours there are things around the club that need to be done so check with Mitch at the General Meeting tomorrow night. A really “Big” thank you to all that came out to help with getting the outdoor range fixed up and closed up for the winter. We accomplished so much on Saturday. All the old wood at the 25 yard target stands were removed and and new wood was installed. That in itself was a big job! The stat house was cleaned up and straightened up too. The target stands at 50 yards were dug out so now the stands should be a bit easier to put in. Also a few trees were cut down. Again, thanks to: Don Kwiatkowski, Bill Frears, Charles Metler, Robert Schweers, James Perry, Richard D’Arcy, Tom Wisiorek, Tom Florkowski, Gene Fechter, Kevin Perry, Mark Bergum, Joe Moronski, Ed Richter, Timothy Colf, Andy Maciejewski, Phil Lanoye, Al Hopkins, Jim Gerstung, Art Young, and of course our fearless leader Mitch Vogel. Many hands made all the work go very smoothly fast. Well done everyone!! Just a heads up that this Sunday Ten X is host a WNYOPL Match and we are in need of volunteers again for this match. Remember this is a great way to get your volunteer hours in. Please signup on this site or contact me (Gail@gfechter85@gmail.com) to sign up. Jim could really use all the help he could get at this point. Thanks again for all you do. This coming Sunday, June 25, Ten X is hosting the WNYOL Match. We are in desperate need of volunteers for this match. This is a great way to get your volunteer hours in for the year. Please contact Gail @ gfechter85@gmail.com or go directly to the volunteer sign up page and volunteer your time. All positions are needed at this time. Thank you.